Now that states are scrambling to set up their own legalized sports betting economies, some observers are wondering what the overall size of the market will be. 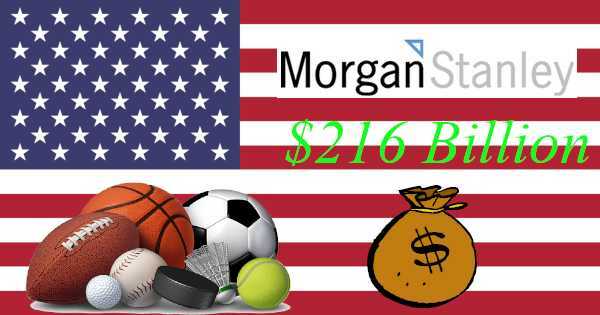 Financial consultancy firm Morgan Stanley foresees greatness in store for legal sportsbooks in the near future, predicting that they will book $216 billion in bets annually in the United States. Although the document was not released publicly, the New York Post was able to review the report by Morgan Stanley, entitled “Gaming, Media, and Internet: US Sports Betting: Who Could Be the Winners?” It was prepared by the firm as part of its work with MGM, advising the casino-resort company on the possibility of a merger with fellow gaming giant Caesars. Possible Merger in the Works? Morgan Stanley predicts that there will be as much as $216 billion wagered in the United States on sporting events annually by 2025. This is just counting fully legal sports betting, excluding offshore sportsbooks and other underground gambling. Morgan Stanley foresees each adult in the country losing an average of $43.50 per year. This estimate is based upon numbers collected from Europe and Australia, which already have mature markets for betting on sports. All this betting activity would result in total revenue of $11 billion per annum. This is about equal to yearly movie box office receipts, so the sportsbook industry would become just as weighty a behemoth as Hollywood should these forecasts prove accurate. The New York Post described the future envisioned by Morgan Stanley as “a bull-case scenario that bookies could only dream of” and “assumes all states legalize sports betting.” This is highly unlikely to transpire particularly in states that have a long record of being anti-gambling, like Hawaii and Utah. We also must remain cognizant of the role Morgan Stanley is playing by advising MGM as to the wisdom of trying to merge with Caesars. While it may seem that the financial services enterprise doesn't have any stake in which way MGM decides, the truth is that Morgan Stanley might benefit from being retained to assist in any merger that eventuates. Thus, it has an incentive for presenting as rosy a picture as possible for legalized sports betting. Although far be it from us to suggest in any way, shape, or form that as honorable and upstanding an organization as Morgan Stanley would ever allow its objectivity and integrity to falter. Since 1992, the only state with traditional single-game sports betting was Nevada because of the prohibitory restrictions contained in the Professional and Amateur Sports Protection Act (PASPA). 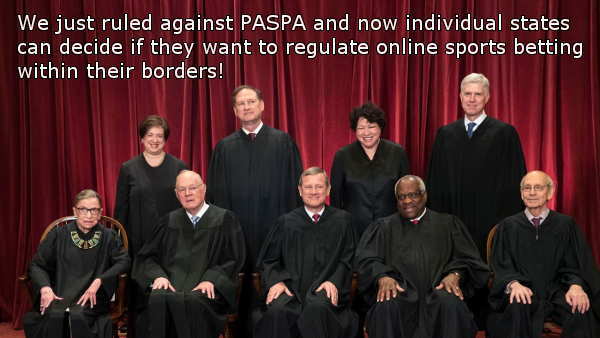 However, the Murphy v. NCAA decision by the Supreme Court in May 2018 voided the PASPA legislation. Now, individual states are free to legislate for sportsbook legalization if they choose to do so. 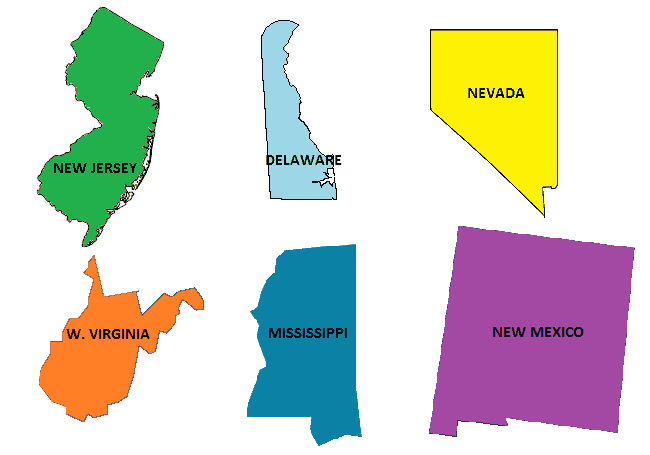 Under the terms of the relevant laws that were passed shortly thereafter, sportsbooks have already opened up in New Jersey, Delaware, West Virginia, and Mississippi. Furthermore, a New Mexico tribe has begun sportsbook operations, based on its understanding of federal Indian law and its tribal compact, without waiting for state lawmakers to pass a bill. Pennsylvania has already enacted the necessary legislation, and its Gaming Control Board has begun approving sports betting license applications, but as yet, no actual PA sportsbooks have appeared. Several other states, including New York, Rhode Island, and Arkansas, are expected to legalize this form of gambling in the next few years. Some of the legal sportsbetting states have a full menu of physical, online, and mobile betting products available, but others have restricted sportsbooks to solely brick-and-mortar locations. In areas without betting via internet and mobile device, we can expect these expansions to occur before too long once the authorities get a taste for the kind of money they can derive from taxing this action. Morgan Stanley's anticipation that all 50 states will eventually host legal sportsbooks is almost assuredly way too optimistic. Still, there is hope for those who aren't fortunate enough to reside in areas that have state-regulated sports betting options. They can always head online and place their bets at an offshore gambling site. There's nothing legally questionable about participating in this activity as a bettor. It's a different case for those actually offering the bets, but they're located far away in jurisdictions where the U.S. government can't touch them. Check out our list of the best offshore USA sportsbooks to learn more about some of our top-rated sites. For information on other online wagering pastimes, browse over to our list of recommended internet casinos or our thorough USA guide to poker online.